Rocky Mountain spotted fever is a potentially fatal infection transmitted to humans by ticks. 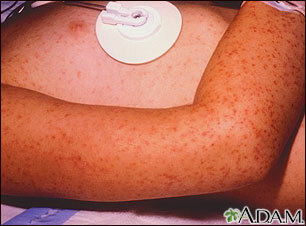 This photograph shows the classical appearing rash which often begins on the wrists and ankles, and spreads rapidly towards the center of the body. The rash may also be present on the palms and soles.